Continuing with the theme of afghans, I want to show some afghans I made for baby gifts. And speaking of Doctor Who, this afghan that I made in 2005 best represents the colors of the Doctor Who scarves. I must not have been able to fit all of these colors into the afghan I made for our living room. Unfortunately, I do not have a photo of this creation. 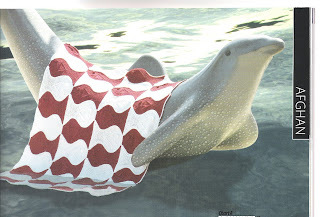 It is based on a picture I saw in one of the Vogue Knitt ing on the Go baby books. 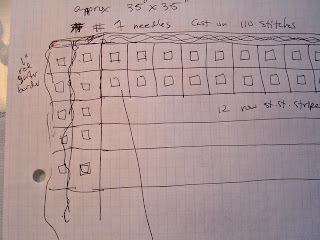 Below is a photo of the notes I made for it. You can see that is was square, 35" x 35". The outside was 2 rows of squares with a square of contrasting color in the center. The inside portion was 12 row stripes. I knit it in one piece in stockinette stitch. There was a garter stitch border around the outside. The good thing about this afghan was the richness and sophistication of the colors for a baby afghan. The bad thing was the blocking, or lack thereof. It would have worked better in wool. As it was, I was not able to get it to lay perfectly square and flat. Also, I picked up the garter stitch border after the main portion was knitted, and I did not pick up the correct number of stitches. It tended to flare. I think that means I picked up too many stitches. I am embarrassed to admit that I did not redo it, as the baby shower was upon me. The next afghan, actually made 6 months earlier than the one above, was not finished in time for the shower, but I was able to show off the pieces. It is the fish afghan from Knitters magazine, Summer 1998 issue. It also appears in Baby and Toddlers: A Knitters Dozen. There are many examples of the finished afghan in Ravelry. It was particularly apt for my pregnant friend, because she loves fishies. Note that the designer of this piece chose to make it in 2 colors. I chose to make in 4 related colors in my favorite color combination of blue and green, using Lion Brand Wool Ease. 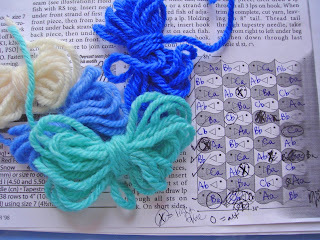 Here is a photo of the yarn I used and some notes showing how I alternated the colors in rows. My daughter, who is good at math, helped me to work out the color sequence. If you check out the photos in Ravelry, you will see that this afghan is considered to be a good scrap afghan, because so many people who made it used a variety of colors, a different color for each fish. I like the results better in the restricted sequence of colors I used. I think it looks more harmonious. With many blocks of unrelated colors, it is hard to know where to rest your eye. 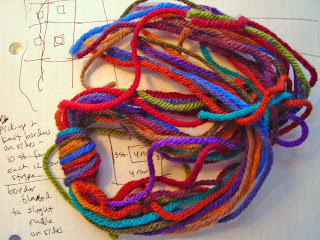 The Wool Ease yarn also worked well for this project. It is soft, and while not entirely blockable, it blocked some. Sewing the fish together (I think I used matress stitch, not crochet) put them under a tension that made them hold their shape.